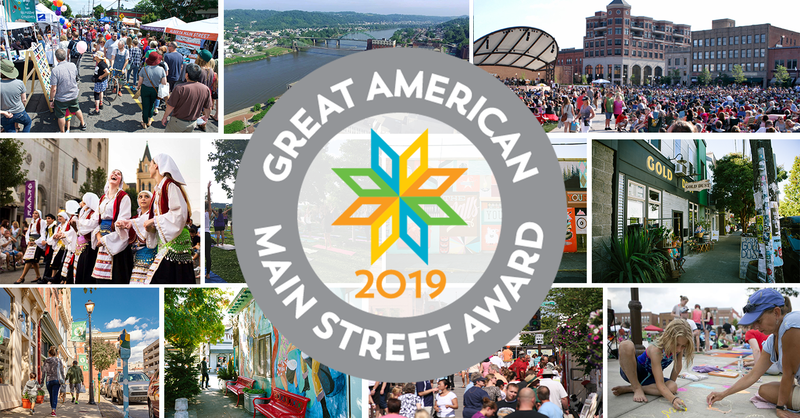 The National Main Street Center announced Alberta Main Street in Portland, Oregon; Wausau River District in Wausau, Wisconsin; and Wheeling Heritage in Wheeling, West Virginia, as the 2019 Great American Main Street Award (GAMSA) winners. GAMSA is the nation’s top award for communities that have excelled in comprehensive preservation-based downtown revitalization. The winners were announced at the National Main Streets Center’s annual conference in Seattle, Washington. After decades of disinvestment, Alberta Main Street has become a bustling and inclusive arts district. Since the Alberta Main Street program formed in 2010, they have worked to create an equitable commercial district by offering programs that encourage small business development and property ownership among residents who have been historically marginalized from economic growth. Today, over fifty percent of Alberta businesses are women-owned and 23 percent are minority-owned. Growth has rippled across the district. Forty-four new businesses have started since 2010 and job opportunities have nearly doubled—from 696 in 2010 to 1,375 in 2018. Main Street is now lined with locally-owned businesses, public art, and programming with low barriers for entry. Last year, events, programs, and activities drew 30,000 people to the district, with an estimated economic impact of over $5 million. Wausau River District has generated nearly $120 million in public and private investment, added rich programming, and expanded their partnerships to transform their commercial corridor into an arts and culture hub of north central Wisconsin. Located along the Wisconsin River, Wausau has focused on developing unique public spaces and special events that showcase the character and natural beauty of their downtown. Before Wausau River District formed in 2002, their downtown faced a decade of competition from big box stores, resulting in a constant flight of local businesses. Between 2002 and 2010, Wausau River District advocated for new developments and redesigned streets to make them wider and more walkable. These efforts, combined with significant public and private investment, have sparked a transformation. Downtown Wausau’s vacancy rate has gone from 13 percent to 3 percent since 2002, and residential development has swelled. Their downtown has generated more than 1,000 new jobs and 104 net new businesses since 2002. A town of 28,000 along the Ohio River, Wheeling has turned their once blighted downtown into an economic engine for the community. Wheeling saw disinvestment in the 1980s and 90s as retailers went to suburban shopping malls and major local industries suffered losses. But in the only four years since Wheeling’s Main Street program launched, they have generated $50 million in total investment, rehabbed 124 buildings, and lowered their downtown’s vacancy rate from 32 percent to 15 percent. Thanks to a growing downtown shopping, dining, and arts scene, anchored by the iconic Capitol Theater and Centre Market Historic District, more people are living in downtown Wheeling than ever before. Once vacant buildings, including a former department store and warehouse, have become unique living spaces. While there were no multi-family market-rate apartments in 2015, there are now 100 new multi-family, market-rate units downtown. Home to pivotal moments in both the Revolutionary and Civil Wars, Wheeling can look to a brighter future thanks to the tremendous work of Wheeling Heritage and its local partners.